Preheat the oven to 375 degrees F. Arrange the chicken in a shallow, nonstick baking pan. Put the olive oil in a nonstick skillet, low heat and wilt the onion. Stir occasionally for five minutes. Add the garlic and stir occasionally for another five minutes. Add the rosemary. Add the onion mixture to the chicken, coating thoroughly. Add salt and pepper and top chicken with marinara. Pour the water in the bottom of the baking pan. 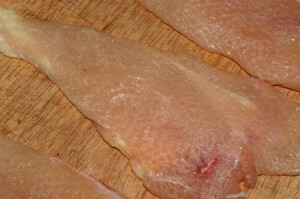 Bake until the chicken is cooked through, usually 30-40 minutes. Baste the chicken often. Baked chicken breast is a good source of protein, and a healthy low-fat option for dinner. Some food that goes well with rosemary chicken are, red skin potatoes, and any steamed vegetables. There are several wines that are also considered good pairings with roasted chicken, such as, Chardonnay, Merlot, and Cabernet Sauvignon.